Welcome to another February 2017 issue of GL's newsletter. In this issue, we focus on solutions for Consolidated Reporting for Large Contact Call Centers. Such a system can provide valuable information for optimizing resources such as trunk sizing, call distribution, IVR capacity, human attendants, and similar “expensive” resources. 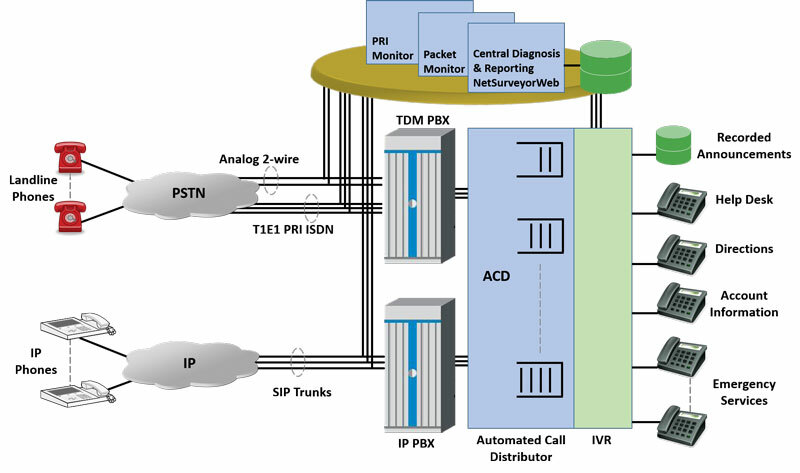 A typical system is shown below consisting of T1 E1 PRI Trunks, SIP Trunks, IVR (Interactive Voice Response) System, Call Distribution (Queuing) and Attendants/Departments for Specific Services e.g. Recorded Announcements, Help Desk, Emergency Services, Directions, Account Information, etc. This newsletter outlines a project performed for a prominent Maryland-based Call Contact Center, wherein GL customized its T1 E1 PRI Monitoring system and NetSurveyorWeb™ with a commercial off-the-shelf (COTS) IVR System. The consolidated information obtained helped to provide valuable information for cost effective trunk sizing, IVR capacity, # of human attendants, and recorded announcements. Any network operator, service provider, or equipment manufacturer must have the means to perform capture and surveillance tasks remotely, automatically, and non-intrusively. Fortunately, the network backbone contains a wealth of information that can be monitored and collected to support these activities. GL's Network Monitoring and Diagnostic Systems are web-based applications that facilitate display of Call Detail Records (CDRs) by connecting to TDM, Optical, or IP probes through a web server for monitoring physical layer, signaling and traffic. Currently supported protocols include SIP, VoIP (SIGTRAN, SIP, H.323), SS7, ISDN, GSM, TRAU, MAP and more. GL's NetSurveyorWeb™ is based on a scalable and flexible architecture and is used in conjunction with GL's Protocol Analyzer probes to non-intrusively monitor from a single or multiple testing locations. 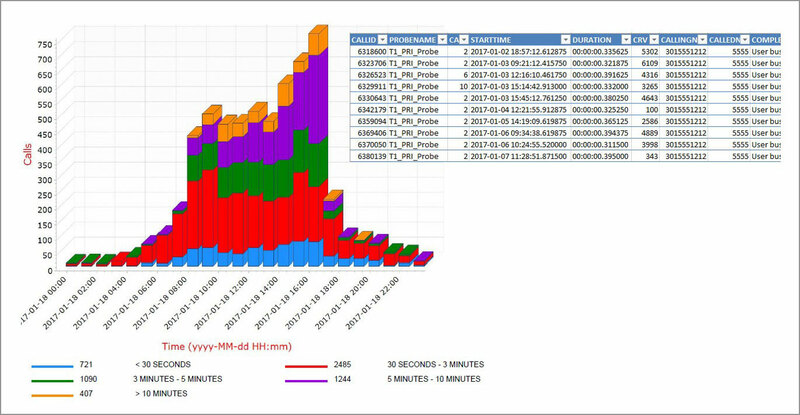 GL's protocol analysis probes feed data to a database in real-time for further analysis. The NetSurveyorWeb™ client application then locally or remotely facilitates viewing records from the database using a simple web browser application. Recently, a Maryland-based Call Contact Center utilized GL's expertise for evaluating call volumes, Interactive Voice Response (IVR) statistics as well as other contact center statistics. At the center of the solution were GL's T1 E1 ISDN PRI Trunk Monitoring System and Oracle based NetSurveyorWeb™. GL also utilized its quick/easy Query software for interrogation of other Information Systems to present a Consolidated Report for contact call center key statistics. Information presented in this report was gathered from multiple locations, including GL's analysis probes monitoring multiple carrier T1-PRIs. GL also acquired statistics from multiple application servers that provided important call, IVR and agent statistics. This project involved developing a software application that interfaced through an Application Protocol Interface (API) to a Genesys Voice Platform based IVR. Multiple project stakeholder meetings were necessary to understand the relevant statistics included in the Consolidated Report.